Does increasing productivity destroy jobs? There’s been a lot of debate about productivity in the last couple of days, off the back of our new report on the ‘long tail’. In and amongst this discussion, one thorny question that has been raised is whether improving productivity is bad for inclusive growth. In particular, do improvements in productivity come at the cost of jobs? 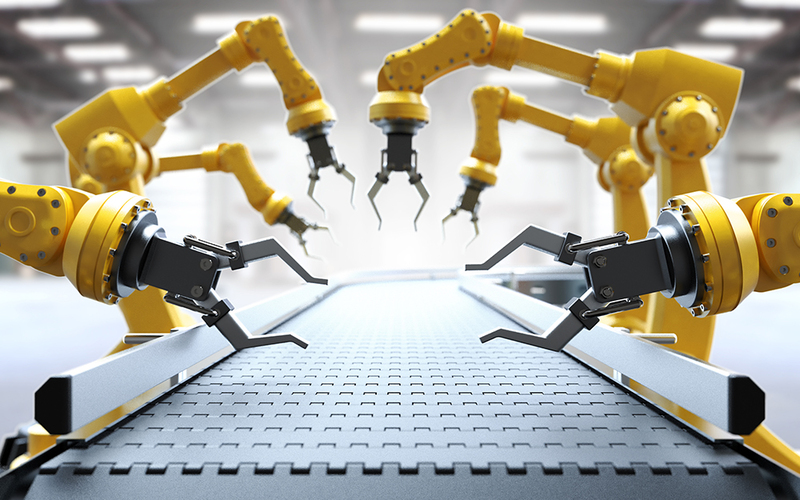 The concern about these issues is understandable – in some sectors, improvements in productivity have come through the introduction of machines which destroy jobs. Manufacturing is a case in point. There are many fewer people employed in manufacturing today than in the past – 4 million, which is 60 per cent fewer than 1978. What is less well known, however, is that the amount that UK manufacturing produces has actually gone up in that period by 17 per cent as a result of improvements to productivity. But there are two reasons why productivity improvements don’t mean job losses across the economy. The first is that while the sectors that have been responsible for productivity growth in recent years have not been directly responsible for jobs growth, they have spurred employment in other sectors. As the chart below shows, ‘exporting’ sectors (those that sell to a regional, national or international market), for example in the manufacturing and finance sectors, have seen large productivity growth but a fall in employment. Those sectors that have been responsible for employment growth, on the other hand, tend to be local services, such as accommodation and food services and arts, recreation and entertainment. These firms, as our briefing shows, have seen little or no productivity growth in recent decades. The one clear exception to this is information and communications, which has managed to provide both productivity and employment growth. But the performance of these sectors is linked. While exporting businesses don’t create jobs directly, research suggests that the wage-increases they create through productivity growth also increases demand for local services, which in turn boosts employment in these sectors. This is known as the multiplier effect. The second reason is that these fears are based on what the economy looks like today, rather than what it will be tomorrow. 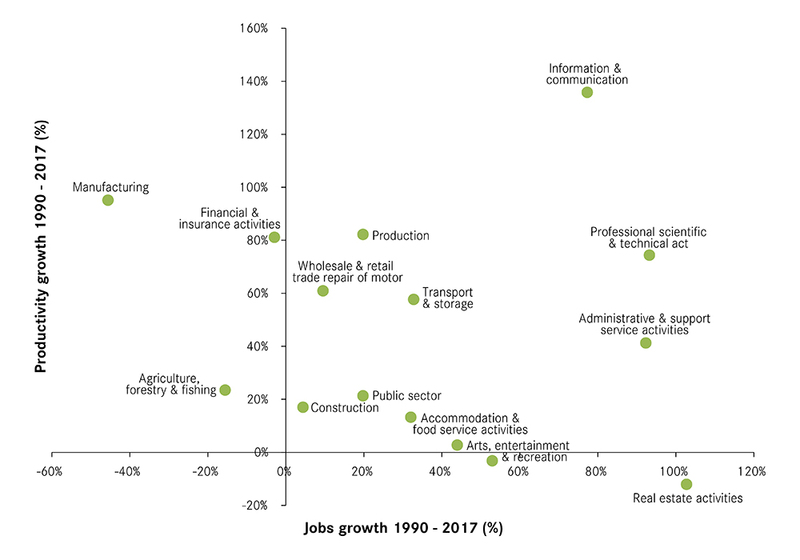 Different sectors grow and decline through time, and it’s the rise of new sectors that historically have more than replaced jobs lost in those declining ones. Looking at 100 years of economic development in UK cities, as we did in Cities Outlook 2018, shows this. There have been huge changes in the economy over that period, including large increases in productivity and an unabated rise of automation. Despite this, there are 60 per cent more jobs in urban Britain today than there were in 1911. And few would argue that we aren’t better off than our great-grandparents. Increases in productivity may well mean that jobs decline in some sectors. It’s easy to envisage that retail will employ fewer people in 10 years’ time than it does today. But these productivity improvements also create new opportunities, new types of economic activity and new jobs. And they ultimately lead to improvements in standards of living – again, compare life in 1911 to today. While this is good for the economy overall, it obviously isn’t good for individuals who lose their jobs as a result of these changes. The challenge, then, for policy makers, is not only to address the UK’s poor recent productivity performance – it is to ensure that people who miss out can benefit from the new jobs that this growth would create. Now it is 412ppm and heading towards climate disaster. More productivity -> more GDP -> more CO2. More GDP -> More affluent people rushing around screwing up the climate (& the poor). Lower productivity and easier lives in wooden prefabs with market gardens anyone?